FeastHome Reviews – Are you wondering which best chef knife to buy in 2019? When there are a lot of knife brands and products available in the market, finding one that suits your need and taste can take time. That’s the reason why you are reading this page now. 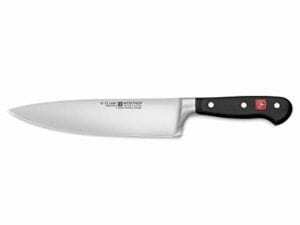 Instead of browsing any possible chef knife available out there and compare one to another by your own, I give you a practical solution here: a list of most recommended chef knives you can find in the market today. I’ve done the research for you, so you don’t need to spend lots of time comparing one knife to another. Without further ado, here are my top picks of the best chef knives in the market. Although opting for a chef’s knife is highly about personal preference, it’s safe to say that the Mac MTH-80 is one of the most generally alluring knives out there. It’s proven by the impressive 4.6 average rating on Amazon. It has an intuitive design which makes it perfect for most hand sizes and skill levels. It’s also wide enough to maintain your food together. It comes in a comfortable design, dimpled blade, and balanced weight. 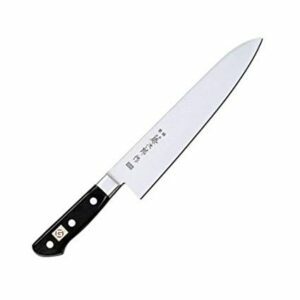 If you want to buy a chef knife that isn’t as expensive as the Mac MTH-80, the Tojiro DP chef knife can be a great option. This Japanese knife is absolutely sharp and comes in an affordable price range. Moreover, this knife comes in a flat belly curve, making it ideal to be used in a push-pull cutting movement. It’s also perfect for fine cuts and thin slices of meat or vegetables. It’s made of super-hard steel and comes in quality construction. Compared to the previous candidate, this knife is thinner and more fragile. 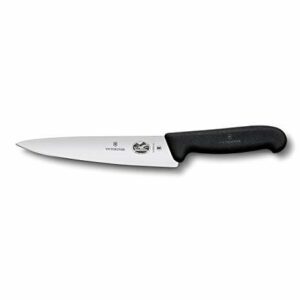 This Victorinox Fibrox is an ideal option for those who want to start cooking on a regular basis but aren’t yet ready to invest in much money. As the best chef knife for beginners, you can bring it to your home kitchen for around $45 only. This knife is designed in European style. It means that the blade is slightly thicker and wider than the common Japanese-style knives. It’s absolutely budget-friendly chef knife. It comes with a plastic handle. If you have small hands, you will need a knife which is lightweight and small, yet is still precisely balanced. 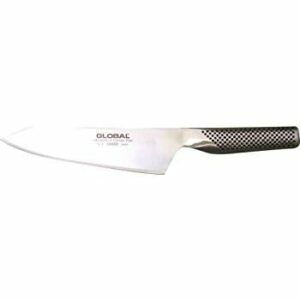 For this reason, the Global Oriental chef knife is an ideal option that you can count on. It’s a great knife with an impressive blade. 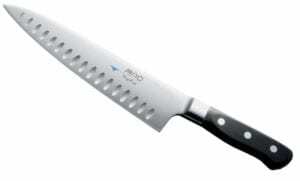 This chef knife also gains an excellent average rating on Amazon with 4.6 stars out of 5 with lots of positive reviews. It owns special handles which are structured for small to medium-sized hands. It comes with a lifetime warranty for defect and breaking. You should use it with care since the blades are sharp. Wusthoff has been a popular global company that offers a high-quality product. This classic 8-inch chef’s knife becomes one of the best products that you can rely on. This knife is highly dependable to cut and mincemeat, or any other task. It can be utilized for multiple purposes. 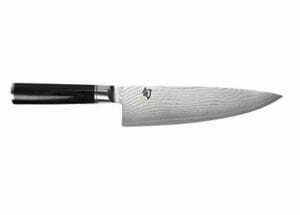 If you are seeking out the best chef knife that is perfect for experienced chefs, the Shun Classic can be the right choice. This knife is a lightweight Japanese-style knife with a half bolster. It comes with great balance and high-quality steel. The exceptional D-shaped handle of this knife receives positive responses from professional chefs. It also currently owns a great average rating on Amazon with 4.6 stars. It’s functional and offers a beautiful design. It’s not for beginners and needs a high level of maintenance. 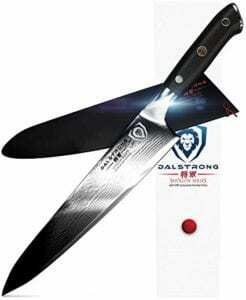 The Dalstrong makes it possible for you to get a great chef knife with only $50 budget. This knife is made from super-strong forged German steel. It comes in stunning design to provide an impressive performance despite its low-range price. Besides, it is also designed with an ergonomic handle that features non-slip grip as well as temperature resistance. It’s offered with a lifetime warranty. It comes in multiple lengths to choose from. The thin bolster may cause accidents if it’s used without care. In conclusion, depending on your cooking style and needs, you can opt for the best chef knife to buy in 2019. I hope the list above can help you find your favorite chef kitchen. So, happy shopping!